Typically I shy away from short fiction collections unless I see the name King or Gaiman or some other major league writer on the cover in large letters. So to say that I approached Wicked Seasons: The Journal of the New England Horror Writers, Volume II, with trepidation is an understatement. However, what a treat it turned out to be, especially for this horror-loving writer and reader. I was immediately engrossed (and a bit grossed out) by the stories presented in this annual collection. There’s not a lot here that one might label traditional horror, though the stories are definitely spooky, humorous, eerie and twisted. More akin to old episodes of Outer Limits, Alfred Hitchcock Presents or Tales from the Darkside. The thread of suspense and bizarre is definitely on display. However, every wicked story is right at home in this collection, and fit nicely into the breeding ground of dark fiction that is New England. Wicked Seasons is edited by Stacey Longo and contains stories from Rob Smales, Scott Goudsward, Kristy Peterson Schoonover, Catherine Grant, Christopher Golden, and James A. Moore, to name a few. The collection does not stumble in presenting the strange, macabre, or downright grisly. You’ll not find the monsters and aliens of stories that might have appeared in the fifties or sixties in this anthology, but monsters of the more or less human kind. Catherine Grant’s “Three Fat Guys Soap” is just such a story, in which a strange and horrific method of making soap becomes a stunning act of revenge, and is immensely satisfying for anyone who has ever been bullied by their boss. “Blood Prophet,” by Scott T. Goudsward, is another example of the horror of humanity in which child abuse and religious dementia play a center stage role, and makes the ending all the more satisfying. Christopher Golden brings us “The Secret Backs of Things,” which brings to mind Bradbury’s Something Wicked This Way Comes. It’s a puzzle in which events are merely hinted at, leaving the reader to figure the rest out. “The Basement Legs,” by Robert J. Duperre, tells about a man who comes to the defense of a young, pregnant Filipino woman who lives in his apartment building. Duperre earns kudos here for bringing a whole new meaning to your local UPS service. Kristi Petersen Schoonover writes “To Chance Tomorrow,” a cautionary story about science’s role in our lives, and the dubious changes it provides for our future, but at what cost? If it’s hauntings that scare you, Addison Clift’s “Furious Demon” is a deliciously creepy tale of a woman’s dead father coming back to haunt her and who very well may have molested her when she was a child. Rob Smales’s “A Night at the Show” and Errick A. Nunnally’s “Lycanthrobastards” are dark werewolf tales that provide surprising departures from standard fare, with fantastic results. The Wicked Seasons table of contents also includes Trisha J. Wooldridge, Lucien E.G. Spelman, Michael J. Evans, Paul McMahon, and Gregory L. Norris—all very entertaining and chilling reads. 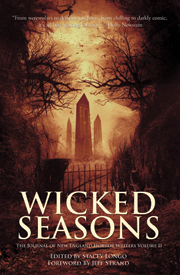 For someone who doesn’t often read anthologies, Wicked Seasons exceeded all expectations and converted this reader to seeking out other, similar collections. Also, don’t miss the introduction from Jeff Strand. It’s as entertaining as the central stories. I loved Christmas when I was a little girl. Santa Claus, the tree twinkling with lights in my living room, the anticipation of presents and cookies. The enchantment waned in my teen and young adult years, of course, but once I became a parent, the holiday was exciting once again. I loved providing the magic of Christmas for my own kids. Santa has been out of the picture for us for several years now, and Christmas these days is more a source of stress for me rather than joy. The cleaning, the cooking, shopping, spending money on stuff we really don’t need—I’ve unfortunately become rather cynical about the holidays. It’s always a relief when it’s all over. So all the sappy, sentimental, feel-good TV shows, movies, and stories don’t do anything for me. I will admit to still enjoying Rudolph and Charlie Brown, and my favorite Christmas movie is The Santa Clause 2 with Tim Allen, but otherwise, I find myself rolling my eyes a lot during the months of November and December. And don’t get me started on the saturation of Christmas music for two months. Then I was asked to review O Little Town of Deathlehem, edited by Michael J. Evans and Harrison Graves. Christmas horror? Yes, please! Stories that won’t warm my cold, black heart, stories that would make the Grinch smile. Catherine Grant starts the ball rolling with “One of His Own.” If you’ve never heard of Krampus, do a quick Google search before reading the story; it will be a much more rewarding experience. Krampus and his half-brother Sinterklaaus travel the world together on Christmas Eve—Sinterklaaus is the kind-hearted, benevolent elf who leaves presents, but Krampus is just looking to feed on fearful children. They enter the home of a drug-addled mother whose little girl is neglected and abused. For the first time, Krampus finds himself wanting to take care of a child instead of eating her. He whisks her away with him. As she grows older, she helps him with his quest on Christmas Eve. But then she wants his help with something else. “One of His Own” is a great story, perfectly setting the tone for the anthology. Although their roles as good and evil characters are clear, Krampus and Sinterklaaus aren’t that black and white. Very well written, and the author gave the characters depth you don’t usually find in a short story. Chantal Boudreau’s “Deck the Halls” is a familiar tale of a man who resents his mother and wants his inheritance sooner rather than later. He takes care of her, in order to not lose his coming windfall to nurses and caretakers. But she lingers, much to his chagrin, so he takes matters into his own hands. Things don’t turn out as he planned. Do you prefer live Christmas trees to artificial ones? “With Their Eyes All Aglow” by Jeff C. Carter might just change your mind. Ray is fascinated with insects and spiders. He is looking for a rare, extremely venomous spider in Myanmar, but is ready to return home to his wife and daughter for Christmas. He actually finds the spider colony, but realizes it has infested a once-trendy Christmas tree called “Nordmann Firs.” They are being grown to ship to the States—and Ray realizes that is the exact tree his wife bought several days earlier. I don’t like spiders at all. “With Their Eyes All Aglow” was creepy, and made my skin crawl. Thanks to this story, I now know that real Christmas trees carry usually harmless bugs into homes. I’m sure I’ve heard that before, but was in denial. No more live trees or plants of any kind in my home! “A Christmas to Remember” by JP Behrens could be a peek into Charles Manson’s boyhood until he grew up and gained terrible notoriety. Ten year old Nathan’s parents are Christmas shopping for him and his brother, a difficult task since Nathan seems to be obsessed with all things dark and horrible. His mother caught him dissecting a mouse with glee, and now he’s drawing pictures of mangled and broken animals. After shopping, Nathan’s mom follows him into the woods, and discovers his horrible secret. Somehow the family gets through Christmas, but that night, Nathan’s mom discovers he has put his present to use in the most awful way possible. This story could also be a look into Michael Myers’s childhood. JP Behrens has written a shocking story about every parent’s worst nightmare. 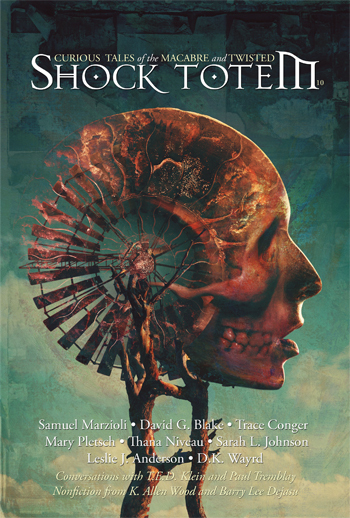 Twenty stories make up this anthology. You’ll find a Santa-werewolf (or would it be werewolf-Santa? 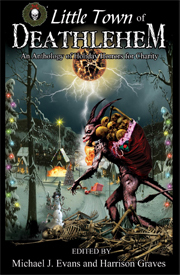 ), evil ornaments, Christmas in a zombie apocalypse, evil Santas, and of course, Krampus. What you won’t find are sappy, sentimental, ABC Family Channel stories. So if you’re tired of Christmas cheer, grab a copy of O Little Town of Deathlehem, and let the holiday dysfunction take you away. O Little Town of Deathlehem is available through Grinning Skull Press. All profits from the anthology benefit the Elizabeth Glaser Pediatric AIDS Foundation.